The ingenious S6240RX saves weight and space by combining a digital high-speed metal geared servo with a 2-channel DSMR receiver in a single unit. 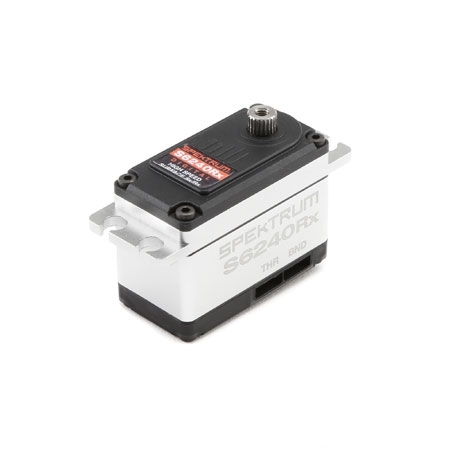 The servo itself features the durability of metal gears and is capable of delivering lightning-fast transit times along with 208 oz-in of torque. The built-in SR2010 receiver is just as impressive. It gives racers a sense of response that feels almost instantaneous, especially when used with a DSMR radio capable of 5.5ms transmission. As if that weren't enough, the S6240RX packs all this capability into a servo case that is shorter than many standard 1/10-scale servos. This is a great match for the TLR 22 2wd series of vehicles that will allow racers to shave even more weight and off their builds than ever before. Futaba Servo-S3003 Standard, 57 Oz/In At .19 Sec. Airtronics Servo-94774 Digital Hi Speed Mg 114oz/In, .10 Sec. Losi Mini-LST/Mini-Baja/Mini-Slider MS20DS Servo Hitec Servo-Hs-425Bb Deluxe Bb; 52 Oz/In At .17 Sec. Airtronics Servo-Mini Digital For 1/12 And 1/18 Micro; 66 Oz./.12 Sec Savox Hv Low Profile Digital Servo Brushless 138 Oz/In, .076 Sec. Futaba BLS671SV HV Brushless Digital Mini Servo, 115 Oz, .10 Sec. Hitec Hs-5646wp Waterproof Digital Servo, 179 Oz/In At .18 Sec.